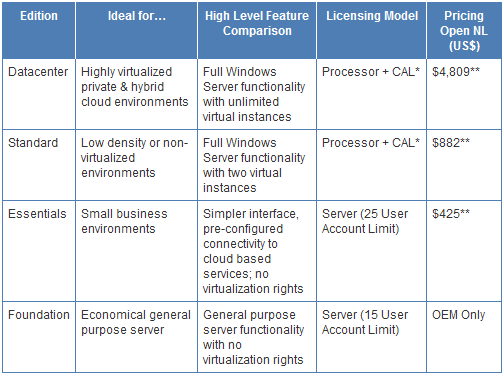 Microsoft presents a new model for licensing Windows Server 2012. Distribution will go to the four licensing models, two for small companies and two for large. Smaller organizations can benefit from licensing Essentials and Foundation, and are available for larger additional two editions of the system: Datacenter and Standard. Datacenter and Standard versions are not different range of functions, but the right of the number of virtual copies. Both versions can be licensed with the processor as well as access licenses specified for the user or device. Interesting is not the Enterprise and Small Business Server, but the latter was replaced by Essentials version. In Microsoft Windows Server 2012 we can’t longer find a version such as Windows Home Server, Small Business Server, Windows Web Server, Windows Server Enterprise Edition, Windows HPC. Tagged License, Microsoft Windows 2012 Licensing, WIndows Server 2012. Bookmark the permalink.